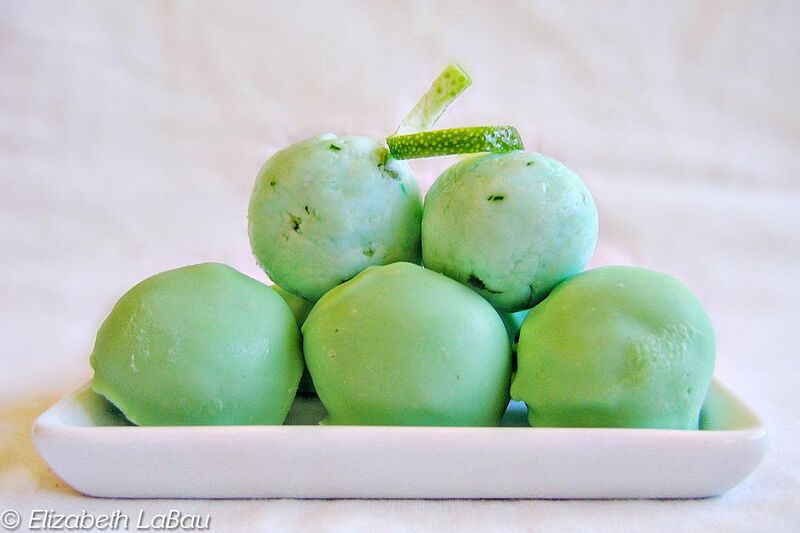 Lime Creams are a zesty, refreshing cream fondant candy dipped in smooth white chocolate. If you prefer, you can omit the chocolate step and serve the creams plain, topped with candied lime zest, or rolled in sugar or green sprinkles. Combine 2 cups of powdered sugar, butter, marshmallow cream, lime juice, salt, lime zest, and food coloring in a large mixing bowl. Mix until well blended. If mixture is too stiff, add a bit more lime juice. If it is too sticky, add a bit more powdered sugar. Roll into balls ¾ inch in diameter, and place on a cookie sheet lined with aluminum foil. Chill for 30 minutes in refrigerator before dipping. Melt the white chocolate with the shortening in the microwave or over a double boiler. If you are coloring the chocolate, stir in the candy food coloring at this point. Dip the cream centers in the melted chocolate one by one and return to the baking sheet.